Lot:9443 Fr. 2402*. 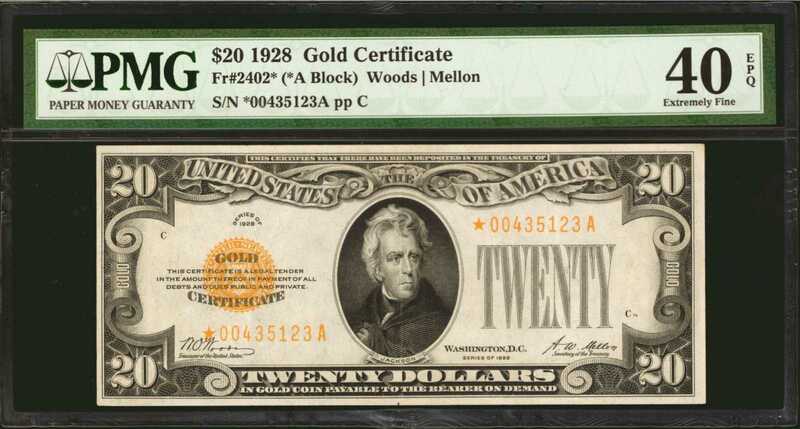 1928 $20 Gold Certificate Star Note. PMG Extremely Fine 40 EPQ. Fr. 2402*. 1928 $20 Gold Certificate Star Note. PMG Extremely Fine 40 EPQ.This stunning Gold Certificate Star has vibrant gold ink and stunning originality. The striking embossing assets to the PMG "Exceptional Paper Quality" comment. Rarely seen this nice and original.